Moleson Connection | Moleson Connection | Ecosign Mountain Resort Planners Ltd. The mountain resorts of Moléson-sur-Gruyères, Les Paccots and Rathvel are located in the Swiss Alps above the town of Bulle, in the Fribourg Canton, 60 kilometers from Lausanne. Ecosign completed a Master Plan Alternatives report for Moléson-sur-Gruyères in October, 2008. 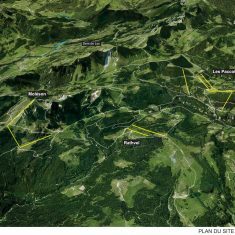 In March 2009, the contract was signed for Ecosign to study potential connections to the adjacent ski resorts of Rathvel and Les Paccots. There is a 25-kilometer long network of snowshoe trails in the Rathvel – Les Paccots area. A very popular 10 kilometer snowshoe tour event “Brevet des Armaillis” (Diploma of the Mountain Farmers) traverses from Moléson to Les Paccots. There are hiking and mountain biking trails that connect the three resorts in the summer, but there are no existing lift and ski piste connections in winter. Ecosign completed a Technical Assessment for the connection study. Ecosign then identified two possible scenarios for the connection of the Moléson-sur-Gruyères, Rathvel, and Les Paccots ski areas in July 2009. After review and input from the client, Ecosign completed the Preferred Connection Concept. The total daily skier capacity of the proposed connection concept would be approximately 5,320 skiers. 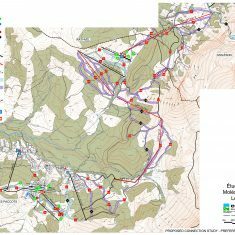 A total of 32 return-cycle ski pistes and 2 skiways are proposed. The ski pistes have a combined slope length of 31.6 km. and would cover 80.8 ha. of area, and be capable of supporting 4,260 skiers at ideal densities.